In May 2018, we were invited to visit Sandals Ochi Beach Resort. One of Sandals’ oldest and largest resorts, I was unsure what to expect from this sprawling corner of the island. 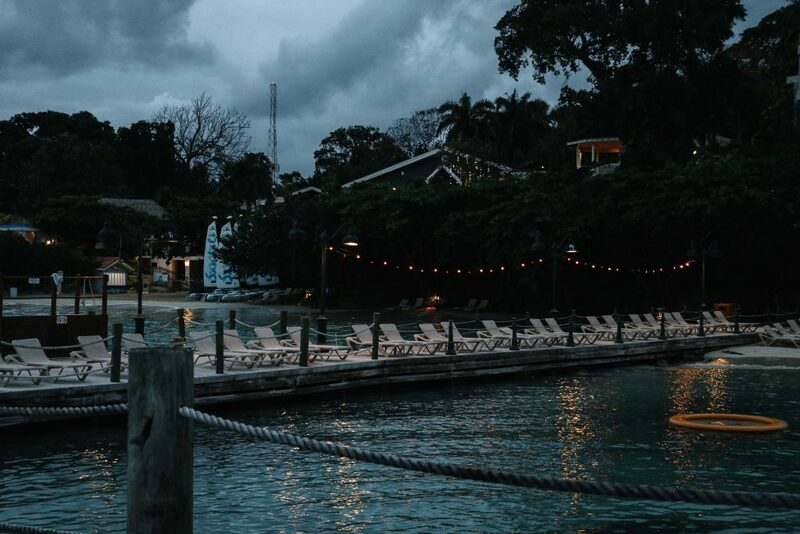 Indeed, with newer – perhaps slicker – Sandals resorts now established across Jamaica, I wondered why people continued to return to this Sandals veteran. Would it be as nice as the other resorts? As enjoyable? As luxurious? 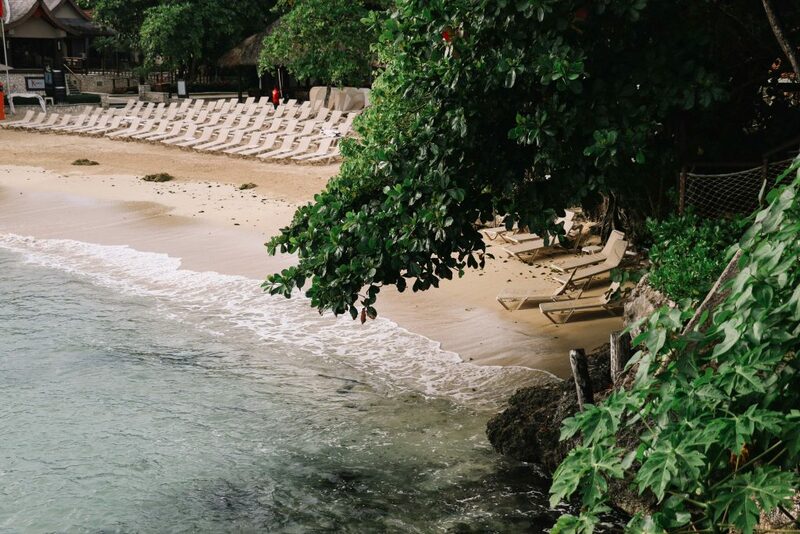 Below is my review of Sandals Ochi Beach Resort, Jamaica – a place that wholly surprised me, in the very best of ways. 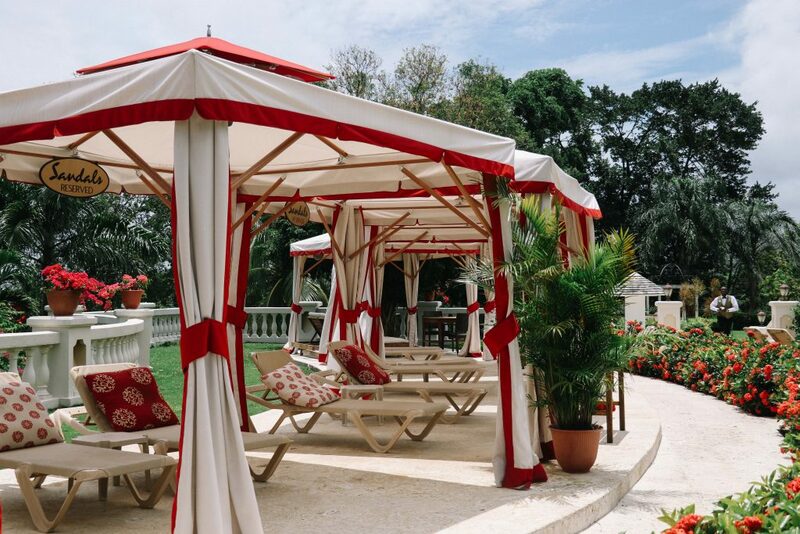 “Where you’ll be staying is the real Jamaica. Jamaica with the jungle and the rivers; the mango trees and the beach. It’s the raw Jamaica I love”, our driver declares. “And you’re going to love it, too”. Having landed in Jamaica just an hour before, we were now headed northwards; our driver and a newly completed bypass guiding us through the island’s forested slopes. Edging inland, Saint Catherine’s Parish giving way to St Ann’s, we climb higher, our driver continuing his speech. “This is the real Jamaica I’m talkin’ about. Climb high above the island and the Blue Mountains squeeze you – you gotta’ breathe in just to make it through”. He takes a sharp inhale and ducks; the mountainsides closing in on either side. “That was close. I’ve got to cut down on the friend plantain”. An hour later and the bypass narrows again, this time weaving its way downwards through a basin filled with coconut groves and sugar cane farms. The whole landscape is a palette of greens. Through the car’s windows I can smell damp earth and warm tarmac; a recent storm lingering over the canopies. “If you like this Jamaica, you’re going to love your new home”, our driver continues. “It’s a true piece of island life”. Indicating, he swings the car around a sweeping bend, pointing upwards towards a winding, tree-lined track. “Sandals Ochi Beach Resort is just up there,” he smiles. “Welcome to Jamaica”. Long associated with high-end luxury, glowing newlyweds and sunset meals, it’s difficult to imagine the Sandals brand identifying itself as ‘raw’. It seems as likely as discovering Simon Cowell on a camping trip; his crisp white shirt crumpled after a night sleeping under tarpaulin. With a penchant for finely combed beaches, waterside villas and Egyptian bed linens, I’d been expecting my review of the Sandals Ochi Beach Resort to no doubt include luxury, but to perhaps not be one that included reference to authenticity. 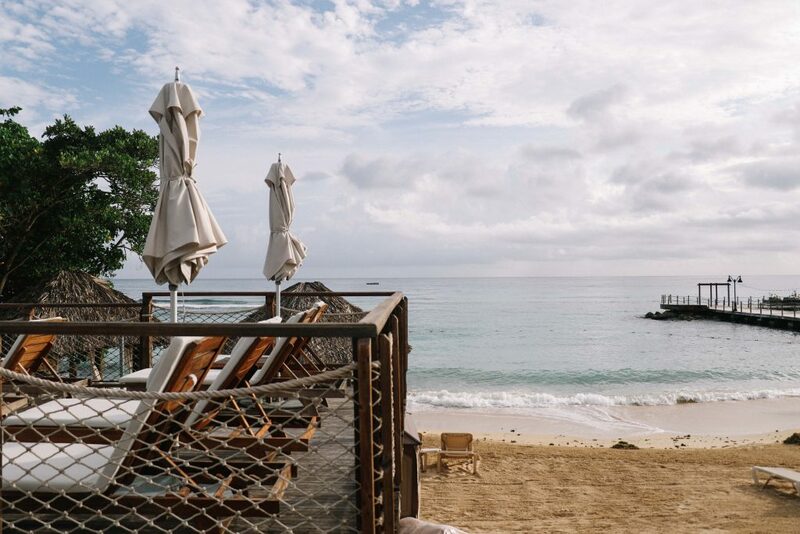 Somewhere between the resort’s glittering spa and fine dining options, I’d imagined that the wild beauty of Jamaica might be a little – well, diluted. Leaving the grey skies of Gatwick airport behind one May morning, we arrived in Jamaica’s bustling capital of Kingston just eight hours later; the newly renovated British Airways World Traveller cabin impressing us with its recently enlarged HD screens, improved chairs and (praise be), USB sockets. Given Sandals’ reputation for romance and honeymooners, I wouldn’t be travelling and writing this review of Sandals Ochi Beach Resort with the help of my usual sidekick (Claire), but with Mike – a perhaps more appropriate partner to enjoy a petal-filled bath with. As with many of the Caribbean islands, Kingston airport offers travel-weary guests its own Sandals hospitality area; the famous Sandals service making an impression from the moment you land. 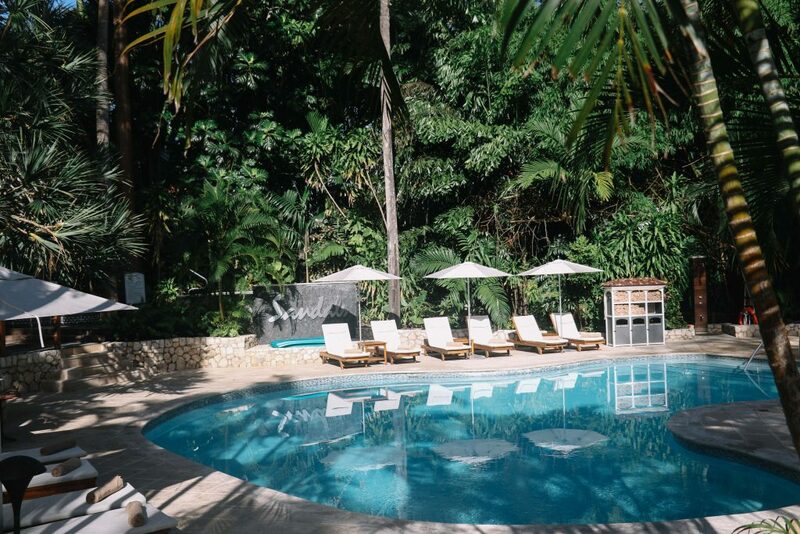 Here guests can grab a cool flannel and ice-cold bottle of water, before taking either a private or group transfer to the resort in Ocho Rios. Both journeys taking just under two hours, with the group transfer being that little bit cheaper. 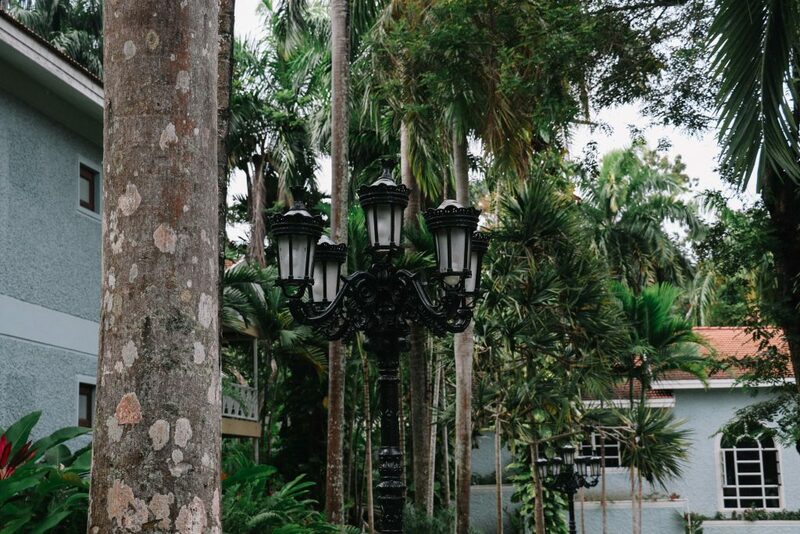 Stepping out of the car and the first thing I noticed was the resort’s lushness: leafy green plants and towering palm trees crowding its hillsides. While it’s perhaps easy to imagine that all Sandals properties are perched on identical picture-perfect beaches (something I’d also assumed), Sandals Ochi Beach Resort instead occupies a sprawling 100 acres: the resort beginning high in the canopied St Ann mountains and finishing at the island’s rugged coastline. 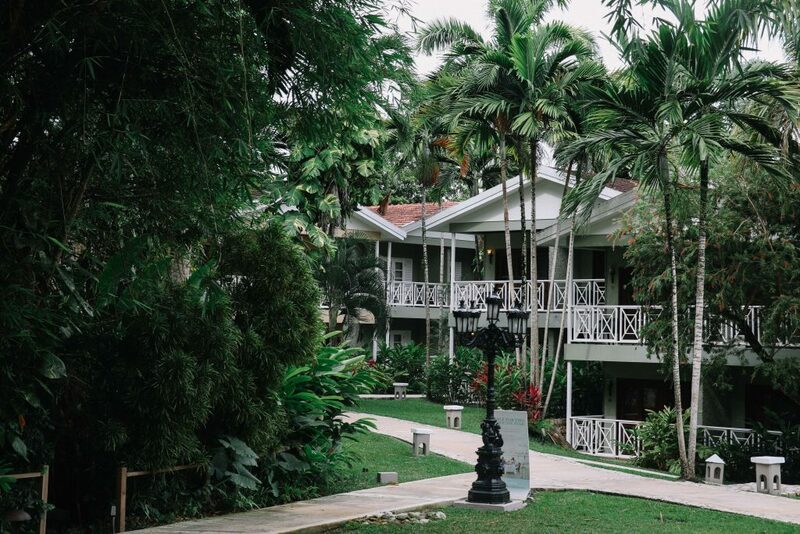 Neither painfully manicured nor pretentiously modelled, the resort is instead nestled into its landscape – a Sandals property that has matured with its surroundings. It was an element of the resort that I loved, and one that I made a mental note of to include in this review of Sandals Ochi Beach Resort. For the duration of our visit, we stayed in the hillside part of the resort known as the Great House and Butler Village. 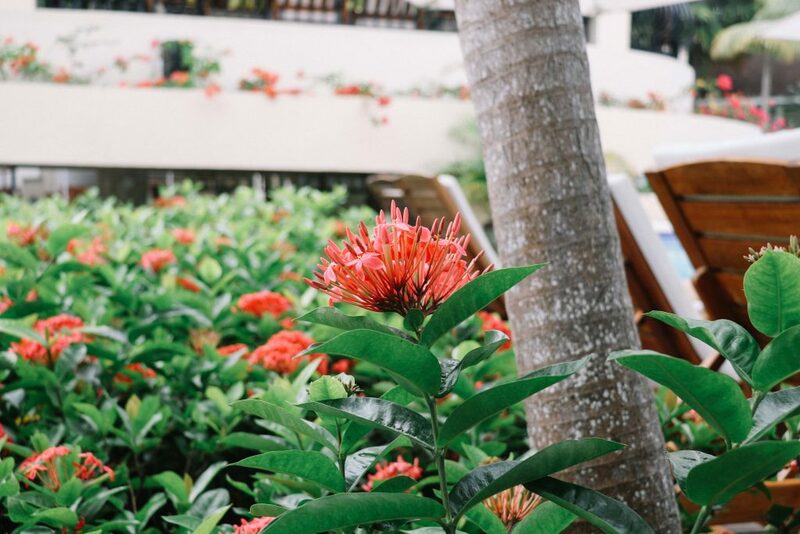 Offering private villas surrounded by hummingbirds and orchids, this part of the resort is incredibly peaceful and quiet. For those who prefer a bit more excitement, then the resort also offers its Caribbean Rivera: beachside accommodation that’s just a 2 minute bus ride away via the ‘Hop’ bus. You can walk between the two resorts if you like, but due to the steepness of the hill and the Caribbean heat, it’s a walk that feels more like an Iron Man competition. Having been renovated to the tune of $60 million in 2015, both parts of the resort are beautifully presented. 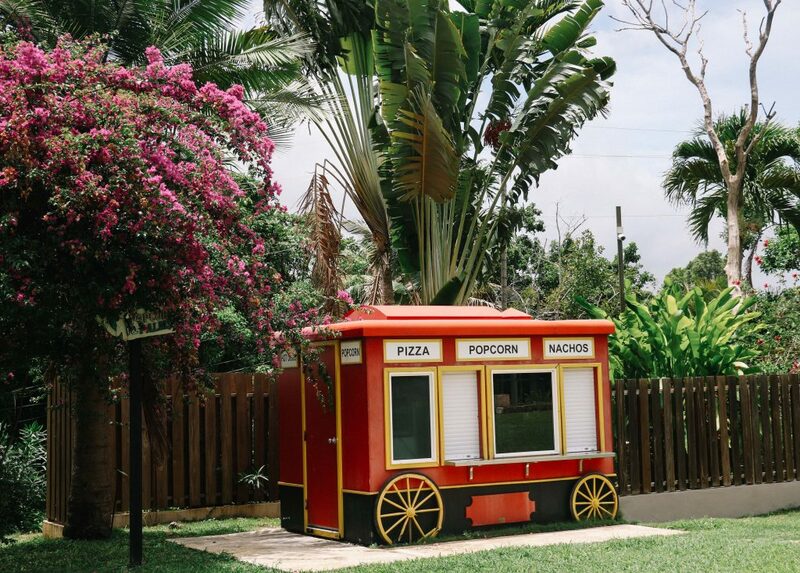 The Great House is a glittering colonial-style mansion, featuring three large pools, an outdoor cinema (complete with wooden popcorn cart) and plenty of places to eat, all of which are hidden under traditional thatched roofs and swaying jungle palms. It’s an area full of hidden spots to sit and relax – with hammocks strung into trees and love seats hidden by ferns. Follow the resort downhill and you’ll be met by a topaz-blue sea; home to the resort’s Caribbean Rivera. Again, rather than being sterile or overly landscaped, this extensive beach area follows an unpredictable coastline, with sun loungers perched on rocky ledges and under leaning mango trees. Here, guests can also float in inflatable pools that fill the ocean, or try their hand at volleyball. 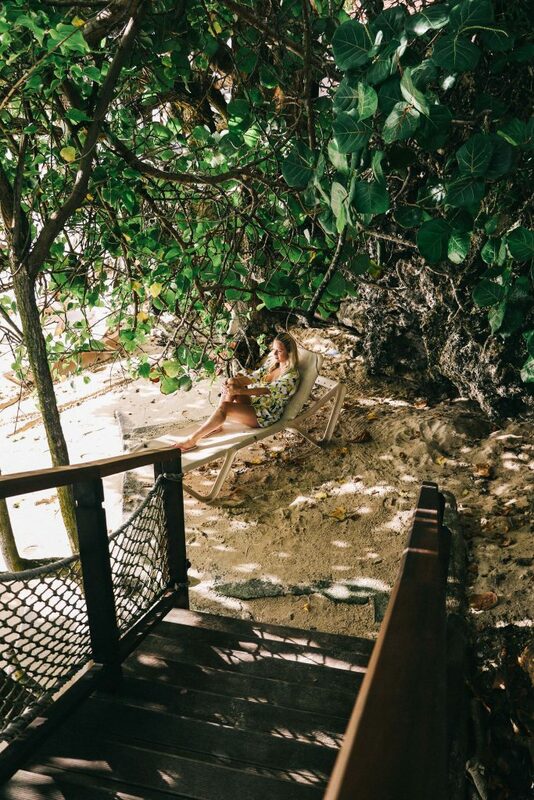 With a giant tree house for guests to lounge in and with the ocean waves crashing below, the Caribbean Rivera felt neither too polished nor contrived, but a little slice of island paradise. For one week and one week only, Mike and I would be residents of the Great House and its Butler Village. Our beautiful accommodation, a Poolside Villa Estate Suite (also known as a ‘G1’ in Sandals speak), sat high in the hillside and shared a pool with one other villa. It also boasted a merry group of resident cats, who Mike spent the week fathering. As we arrived at the villa, dusk was settling and bruised-coloured storm clouds were gathering on the horizon. Inside, however, and our villa glowed softly – rose petals scattered over our four-poster bed and a waiting bottle of champagne in the living room. A cheese plate and dish of chocolate fondants were also placed carefully next to our bed. It would be impossible to write a review of Sandals Ochi Beach Resort and not to mention its interiors. 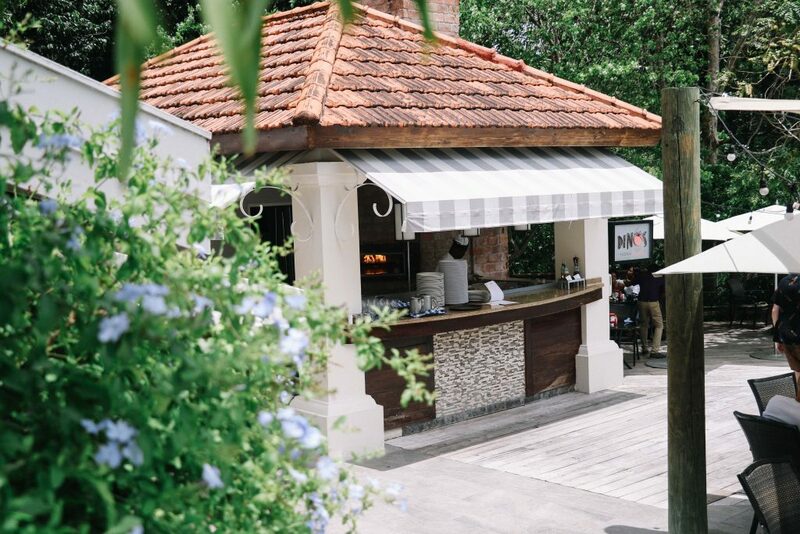 With solid mahogany furniture, a large lounge and kitchenette area (where the magical refilling fridge resided) and an enormous bathroom, our villa felt like a warm and comforting home-from-home. Luxury high-end resorts can often be a little sterile: their rooms almost too serious and clinical. I’ve lost count of the number of times I’ve found myself perched on an awkwardly designed chair, wondering how I’m going to enjoy my cup of tea. Yet Sandals avoids this problem. Blending luxury with comfort, it fills its rooms with squishy sofas, giant beds and soft lighting. Within a few hours our villa felt like ours; a little sanctuary from which to watch the evening storm. Although we were sharing a pool with our lovely neighbours, we rarely saw them. With 105 other swimming pools dotted throughout the Sandals Ochi Beach Resort (a ‘plus’ that must be mentioned in this review of Sandals Ochi Beach Resort), guests are spoilt for choice when it comes to taking a dip. Whilst you might consider paying more for a villa with a private pool, our sense was that a shared pool offered almost exactly the same experience, for a lesser price. Every travel brand has its own USP, its own hidden talent or party trick – and it’s perhaps no secret what Sandals’ is. Before I even knew that I would be writing this review of Sandals Ochi Beach Resort, I was aware of Sandals’ famous pièce de résistance: its famed Butler service. Offered across all of its resorts, the Sandals Butlers are trained in accordance with the Guild of Professional English Butlers; a body that I’d assumed was created solely for the book: ‘Mary Poppins’. Offered to guests staying at the ‘higher suite levels’, we were unsure what to expect when introduced to our Butlers. Having neither been brought up on a sprawling countryside estate, nor within a castle, I felt incredibly English and awkward about the whole thing. What if I struggled to contain my urge to apologise for everything? Or wrestled with them as they tried to carry something? Would the Butler be a constant presence in our lives for the next week? Standing silently in doorways or on the other side of the bathroom door with a spare toilet roll in hand? I started to sweat at the thought of it all. Thankfully, our butlers were far removed from the bumbling, British stereotype I’d been dreading. Easygoing, friendly and welcoming, they greeted us with a big hug and immediately put us at ease. Rather than ‘staff’, they felt more like our much cooler and funnier friends; there to help us out and make us laugh. As I learned, you can employ the services of your Butler as much or as little as you wish. With a mobile phone to contact them on (their shifts run from 7am – 8pm), it’s up to the guest to decide if they require any help. 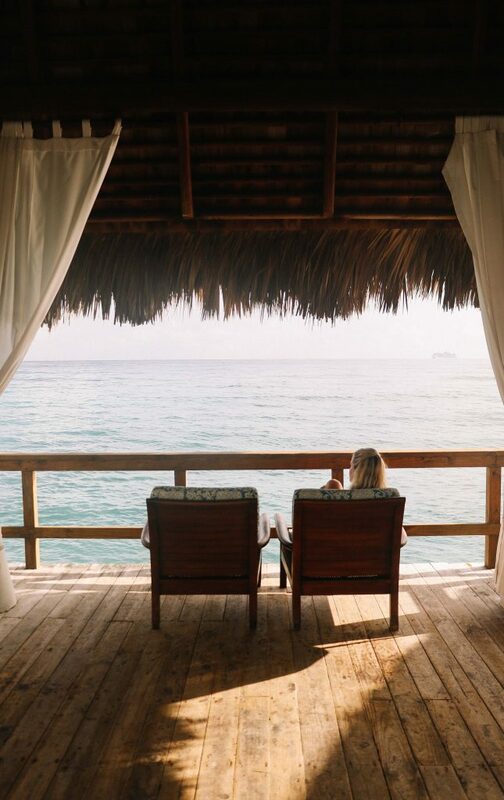 From bringing cocktails to your room to arranging spa treatments; reserving beachside cabanas to running you flower-filled baths, the Butler’s job is simply to remove any niggling tasks and to add a few thoughtful touches to your stay. 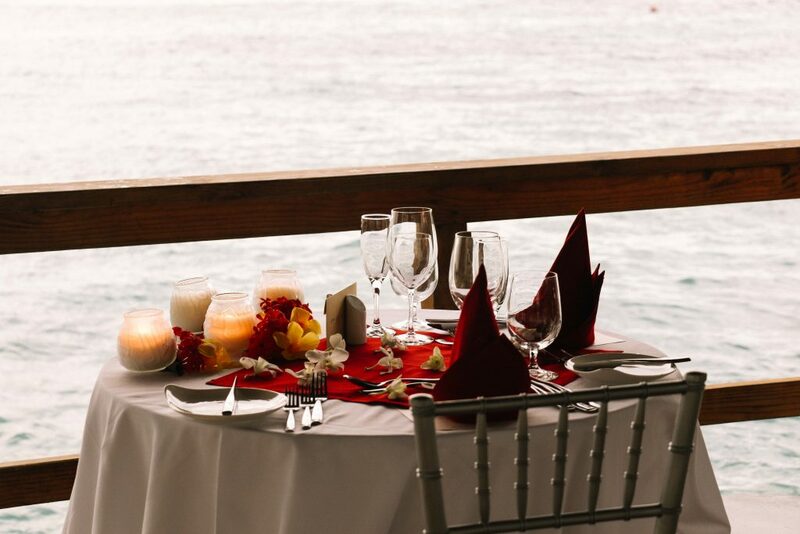 Despite there being 16 different restaurants across the Sandals Ochi Beach Resort, 4 require reservations and the others can fill up quickly (dependent on the season). At the start of the week, our Butlers therefore kindly made all our bookings for us; leaving behind a timetable in our room. 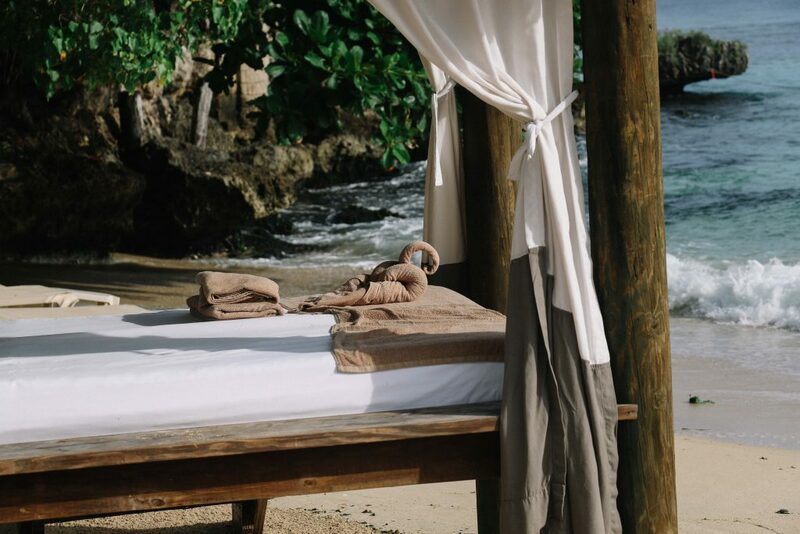 It was an aspect of the Butler service that I found incredibly useful, and a helpful service that I wanted to include in this review of Sandals Ochi Beach Resort Jamaica. In terms of an authentic Jamaican experience, it would perhaps be fair to say that the Butler service distracts from this a little. Heck, it would distract from any ‘every day’ experience. However, I’d stress that this was not a stiff or unduly serious service, but one that allowed us to spend a week with two fantastic people. 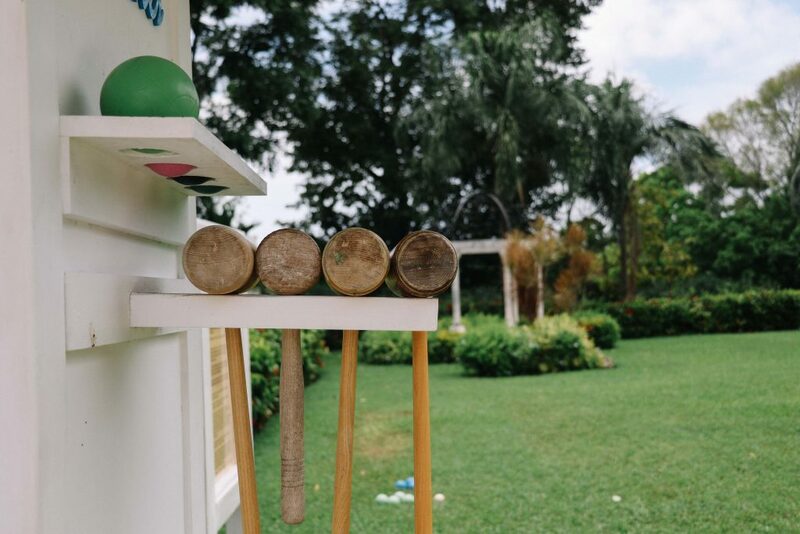 From showing us around the resort and describing the local wildlife, to laughing at us as we awkwardly danced to reggae music, our Butler’s offered a genuine insight into Jamaica’s fun loving and laid back island life. 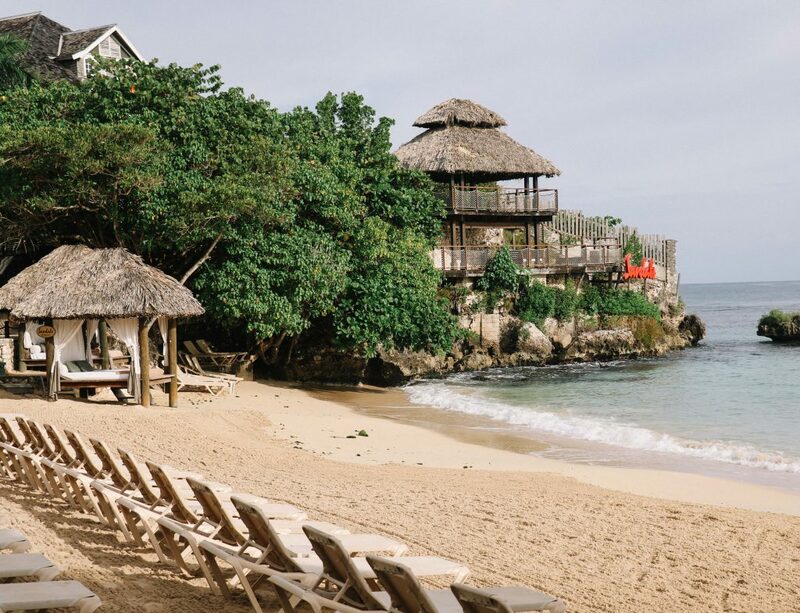 Given the sheer size of the Sandals Ochi Beach Resort Jamaica, it’s perhaps to be expected that it offers a wider variety of restaurants than some of Sandals’ smaller properties. However, I hadn’t anticipated just how many we’d find tucked away next to flowering Hibiscus trees and jungle paths. 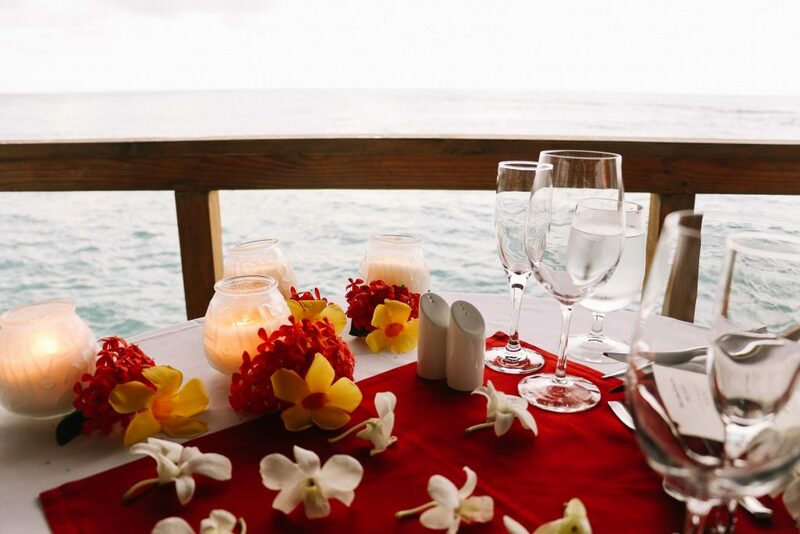 Voted the Number 1 all-inclusive dining experience in the Caribbean, the Ochi Beach Resort opts for waiter-led dining experiences over panicked buffets; and quiet ‘shacks’ over sprawling dining halls. It was an element of the resort that I’d read about in another review of Sandals Ochi Beach Resort Jamaica, and one I was looking forward to experiencing. As mentioned, four of the restaurants require a reservation: Valentino’s (Italian); Kelly’s Dockside (waterfront restaurant); Le Gourmand (French) and Kimono’s (oriental cuisine). We thought all were excellent, with perhaps Le Gourmand pipping the rest to the post in terms of service and atmosphere. We also ate twice at Kelly’s; the waterside setting and glowing fairy lights creating an incredibly relaxing atmosphere. On our first evening – a little creased and tired after a long day of travel – we headed to the Great House, just a short walk from our villa. 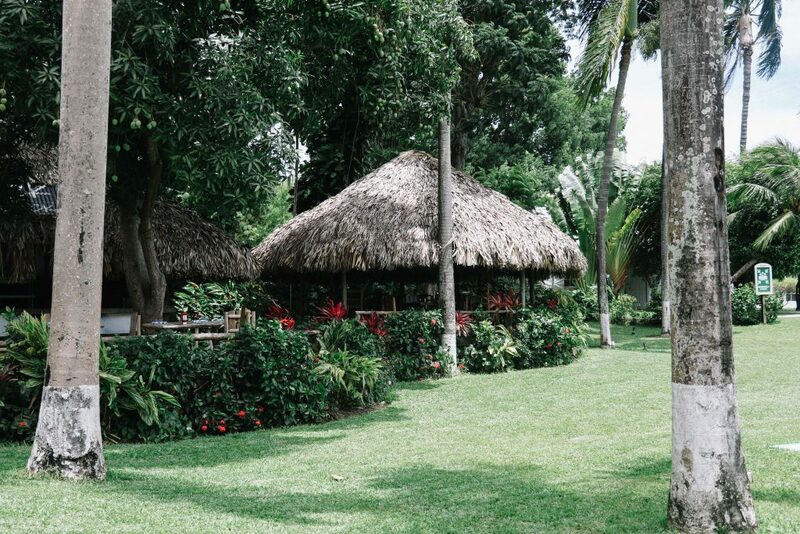 Here, the Manor restaurant offers quiet and relaxed dining, featuring traditional Caribbean food. Over slow-cooked goat curry complete with dumplings and two bottles of Red Stripe beer, Mike and I discussed our new home for the week. 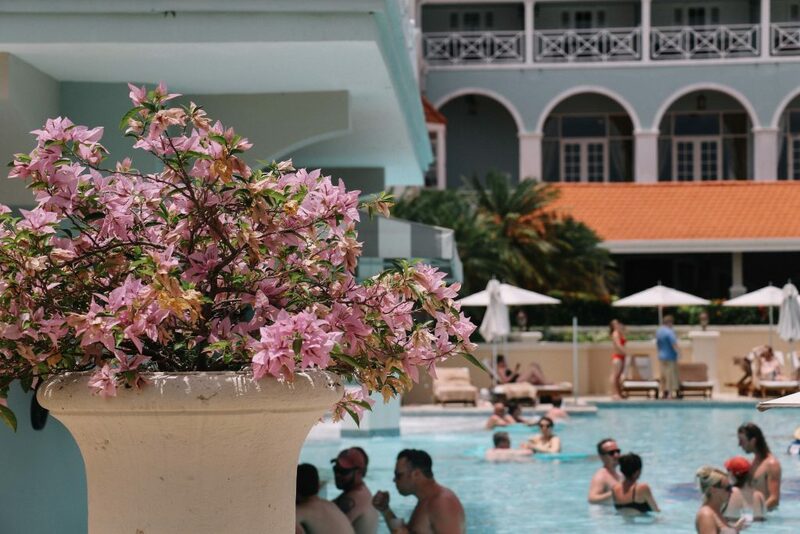 “I can’t believe this is an all-inclusive”, we both repeated – relentlessly. For most, a Sandals holiday means the opportunity to lay next to a glittering pool or turquoise sea for a week, with the odd cocktail to intersperse things. This was certainly our experience, and we spent a lot of time either at the Great House’s infinity pool, or by our own private pool enjoying the rare opportunity to do absolutely nothing. 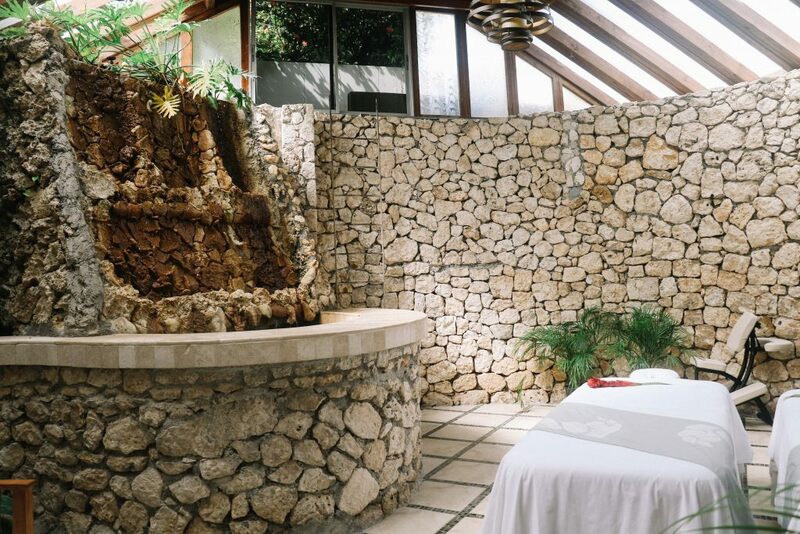 We also took advantage of Sandals’ award-winning Red Lane Spa and enjoyed an hour-long couples’ massage there. 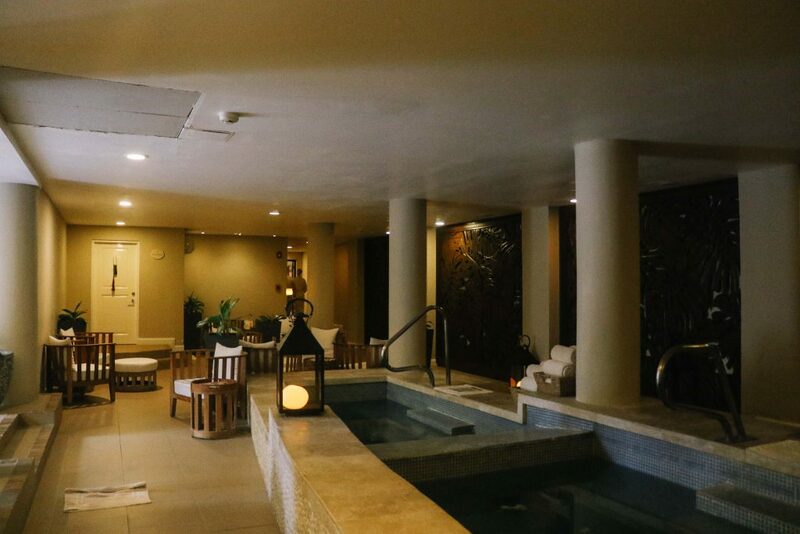 The treatments offered are heavenly (I also opted for a pedicure) and absolutely worth booking; particularly if the weather takes a turn for the worse. 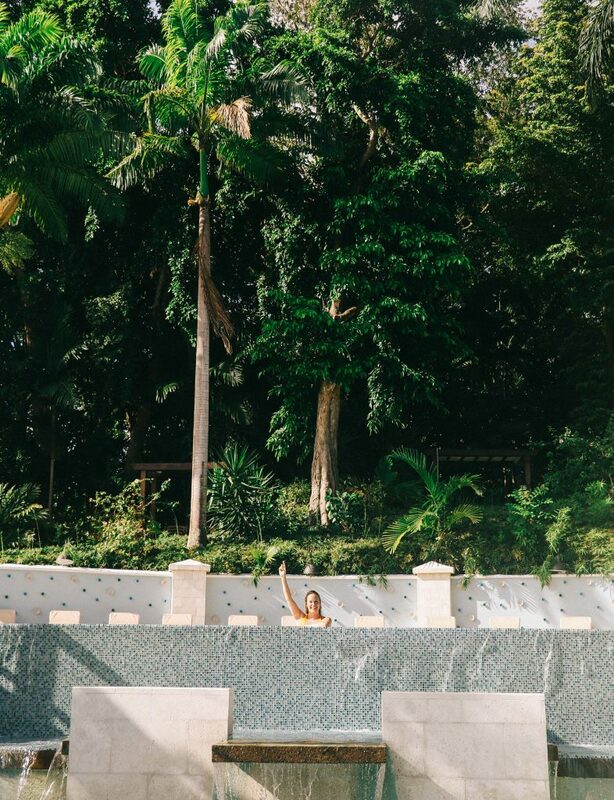 Yet, despite our rambling jungle retreat offering everything we seemingly needed (and for the sake of this review of Sandals Ochi Beach Resort), we were still keen to experience a small adventure; to leave our hillside villa for the deeper jungle. Thankfully, Island Routes (bookable via your Sandals resort) were on hand to help. “Now, I just want to make sure that everyone can swim?” our guide shouts as we glide down Jamaica’s famous White River. “Because at least half of you are going to fall in”. I glance nervously at my fellow ‘tubers’ – all of them firmly embedded inside their inflatable rings, helmets and life vests secured. “Ok, now let go of each other!” Immediately, we scatter across the river, some of us heading downstream, whilst others bob towards the river’s edge. “Here it comes, hold on – and don’t go back for each other if you fall out. It’s too dangerous”. Rounding the corner I stare ahead in abject terror. I’m not sure what to expect: violent rapids? A plunging waterfall? Death? Instead, I’m met with a gentle burst of rapids and a smiling photographer. “People fall for that one every time”, our guide laughs. He stands up out of his ring, the water reaching only his knees. Everyone laughs, embarrassed – but mostly relieved. Earlier that morning, we had taken the bumpy journey from Ocho Rios to the beautiful 17th Century Spanish Bridge. Arching over a crystal clear river – so clear it is difficult to see where the water begins and ends – the bridge marks the start of the jungle river tubing adventure. (As an aside: the journey itself to the bridge is well worth the trip. Climbing far up into the mountainside, past smallholdings filled with wild chickens and goats, it’s a beautiful way to see more of the island). Having been fully decked out in our safety attire, our guide gave us each a new nickname, before we eventually set off: an hour-long journey down the river ahead of us. It’s difficult to explain just how beautifully clear White River is. However, combined with the overhanging flora and fauna, I can assure you that it’s an idyllic and brilliantly fun way to spend a morning, and an activity that had to be included in this review of Sandals Ochi Beach Resort. Just four hours’ long from start to finish, Island Routes provided us with the small hint of adventure we needed to complete our Jamaican experience. Throughout my 7 days at the Sandals Ochi Beach Resort, I’d been thinking about our driver’s description of the place. Raw, authentic, an insight into ‘real’ Jamaica – he’d promised a place where the jungle engulfs private villas and where pockets of beach can be found hidden behind rocky outcrops. In a way, he had been absolutely right. Whilst the Sandals Ochi Beach Resort is undeniably luxurious – with Sandals’ own hallmark of comfort stamped all over it – it is perhaps a little different to its more polished peers (see Claire’s stay at Sandals Grand Antigua). Maybe it’s the sheer size of the place, or the fact it’s one of Sandal’s more established resorts, but Sandals Ochi Beach Resort is a place that seems to have grown out of the landscape surrounding it. Quiet, filled with little spots hidden behind towering seagrape plants, it’s a place to not only be enjoyed, but explored. Of course, my time at Sandals Ochi Beach Resort was not without its luxuries. I cannot claim that I spent a week living locally, or travelled too far from the pool. Yet, nor was my experience an entirely generic one: dominated by tired entertainment or characterless landscapes. 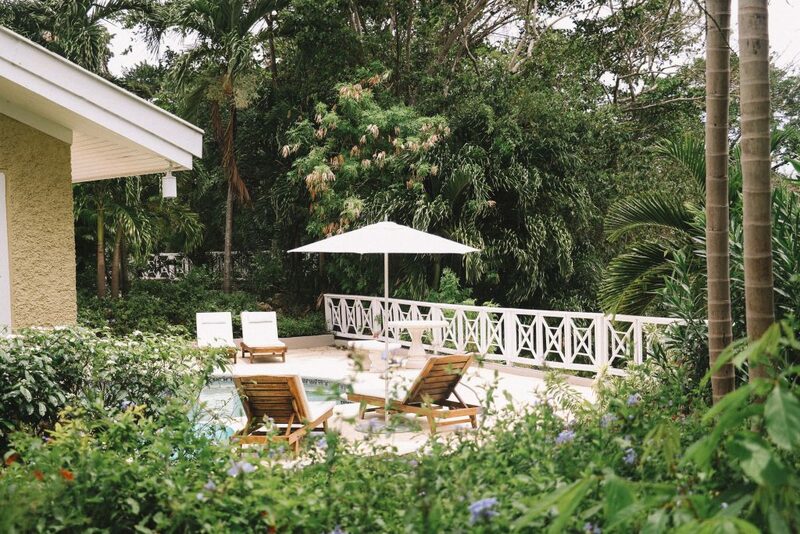 Instead, it was a perfect balance of the two: a piece of luxury, deep in the Jamaican mountains. 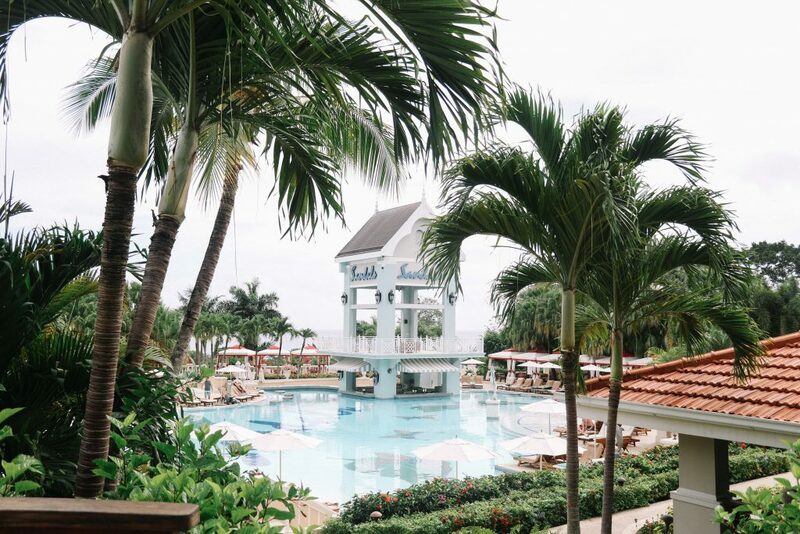 Thank you to Sandals UK for inviting us to review Sandals Ochi Beach Resort, Jamaica. We flew to Jamaica courtesy of British Airways, who fly to ten Caribbean islands from Gatwick Airport. We hope that this review of Sandals Ochi Beach Resort, Jamaica, was helpful. Have you visited? We’d love to know what you think, below. "How To Use IGTV: what we’ve learnt as early users"